This is not finished. It requires much more detail. This is just one part of a series of pictures I drew concerning the Whitechapel murderer. I may start to work more on the other victims as well. I based Kelly's appearance off of eye-witness testimony, descriptions by those who had known her, as well as sketches from the Newspapers of the time. Where needed I made an assumption of the size and width of her head from the notorious photograph. Obviously features such as the nose, the shape of the eyes and lips were a guessing game. I essentially took those details from the police illustrated news. She was described as being attractive in appearance but stout - I tried not to romanticize her. I would be appreciative for any help on a few things concerning me. For instance, the lamp leading up the court, I am not sure if this is accurate? It is opposite of Kelly's room? Also, how close was McCarthy's shop in comparison to the entrance of the court? I have read her words to the man as using "dear" not "darling"-- for what that is worth. Good luck with your work, and welcome to Casebook! Perhaps I misunderstand the quote above, but Hutchinson was not up the court while this exchange was in progress. Astrachan & Kelly are in Dorset street and Hutchinson appears to be across the street watching. Possibly you were influenced by a sketch in the I.P.N. Nov. 24th? - sadly, that was just plain wrong. Looking at Millers Court passage, the door to the left was McCarthy's shop. The yellow square on the wall above the passage appears to show a circle on the bricks, I wondered if that was where a lamp base was mounted to the wall. Even if it was, there's no guarantee it dated back to 1888. 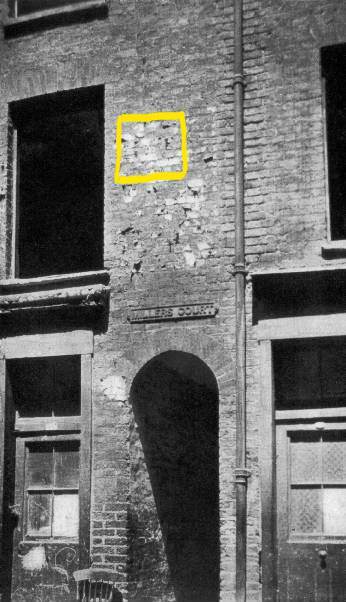 However, the position of a wall mounted lamp is given in a press article at the time of the murders, it was said to be on the wall between the lodging-house next door to No.27 & McCarthy's. That would be too far away to be of any help illuminating Astrachan & Kelly. There was a small wall-mounted lamp outside unit No. 's 1&2 up the court, directly facing room 13. Is that what you are asking about? Last edited by Wickerman; 01-06-2019, 11:25 AM. "There is another well frequented lodging-house next door to M'Carthy's, and within a yard or two to the entrance to the court is a wall lamp, the light from which is thrown nearly on to the passage." Irish Times, 10 Nov. 1888. 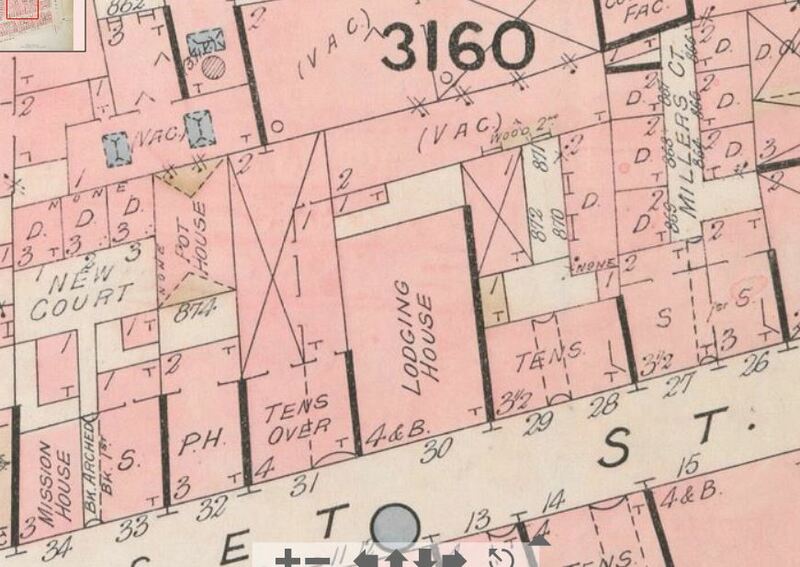 As can be seen here, the lodging-house is No.30, McCarthy's is No.27., so it is not clear how close that lamp might have been. 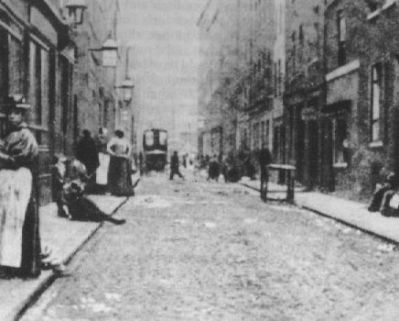 You can see the size of some of those wall mounted lamps in this shot of Dorset street. McCarthy's is supposed to be somewhere behind that group of three people standing midway up, on the left. For all that have replied to this post I would like to say thank you! I appreciate the help. Yes, a lot of it was guess work. I should have looked up the layout of the streets/court on a map. For that I apologize. I will make the immediate changes and will try my best to incorporate them in a newer painting, with more detail, and hopefully that is more accurate. I must say it is quite difficult to see as the resolution appears too dark. I will also have to work on resolving that. I based the victims appearance and the Astrakhan man off of police reports and eye-witness testimony. As for the hair, eye/nose and lip shape, I had to guess. For the width/length of her head, though, I did use the mortuary photograph. The clothing was as follows: I read Kelly was bareheaded and wearing a maroon shawl, and a dark skirt. I do not know whether or not people reported to have seen her in a white apron, but I have also read from Walter Dew (though suspicious) that she was always wearing a spotlessly clean white apron. Last edited by AuroraSarintacos; 01-08-2019, 11:35 AM. I do not know if the bricks of the outside entrance to Miller's Court were whitewashed. They appeared to look like regular brown-red bricks. I am not sure as to the height or the width of the courts entrance. I figured a person would be able to pass through with a fair distance from the floor to the top of the archway; though I am not under the impression that it was of a particularly tall height. I believed it was somewhat narrow. I figured one could see Kelly's room from the entrance. There was a court lamp and it was apparently situated the opposite of Kelly's room. As to how close it would have been I am not sure. I am not even sure if there was any mention of there being a lamp (?). I thought I read that somewhere. I essentially added the lamp to give me light for contrast and allow me the ability to enhance the room/make it more noticeable. The man described by Hutchinson, as I've read in a Newspaper report, was about 5"8 inches with a dark complexion, bushy eyebrows, and a dark mustache turned up at the corners. He wore a dark hat, curled at the ends, wore over his eyes. He had on a long, dark fur trimmed astrakhan coat. Whether or not the coat was made of this material or the fur I could not say, so I guessed. I am also not sure as to whether this may have meant that the collar alone was astrakhan (fleece) or the entire length of the jacket. Or the jacket itself with a fur trim. He was described as having "speckled" pants that were dark, and dark "spats" (a certain type of shoe) with light colored buttons. There was a gold watch/chain hanging from his waist, which had a red jewel. I do know there was suppose to be a white collar and black tie with a horse-shoe pin. As the mans back is turned, I could not add this detail. He carried a black parsel/package wrapped up in a black "american" cloth in his left hand. In his right, a pair of kid gloves. I pictured him stepping into the court with Kelly after she lost her handkerchief. Kelly was described as being bareheaded, wearing a maroon shawl, a linsey frock, with a dark skirt. I haven't heard any reports on her wearing an apron that night but as it was something described as a personal attribute/marker for her by Walter Dew, I added it. Kelly's hair color is a guess. I am still working on all sketches. Thank you for your time, support and patience. Any feedback/suggestions would be appreciated! Last edited by AuroraSarintacos; 01-08-2019, 05:10 PM.